Singaporean Minister of Trade and Industries S. Iswaran presents a memento to Prime Minister Ranil Wickremesinghe on the sidelines of the Sri Lanka-Singapore Business Conference. 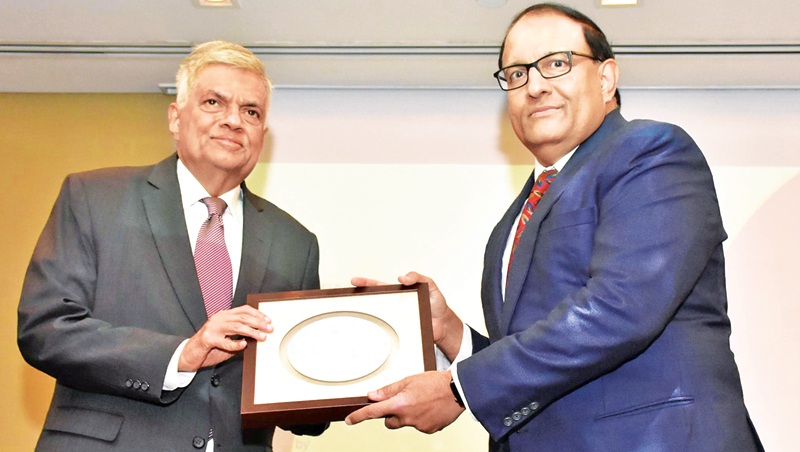 Plans have already been formulated and the necessary foundation laid to transform Sri Lanka into a fully developed country by 2050, Prime Minister Ranil Wickremesinghe said. “Undoubtedly this is a challenging task which ought to be carried forward with patience and prudence by working with a group of people with divergent views,” the Prime Minister said. The Prime Minister expressed these sentiments participating in a Question and Answer session of the Sri Lanka-Singapore Business Conference organised by the Trade and Industry Ministry of Singapore in association with the Singapore Business Forum on July 10. The large number of Sri Lankan and Singaporean Businessmen and Entrepreneurs attended the conference held at the Jan Tanglin Hotel in Singapore. Prime Minister Wickremesinghe said that since Sri Lanka’s strategic location in the Indian Ocean has been clearly understood the longtime target is to develop the country into an Economic, Financial and Social Centre. “Sri Lanka is taking dedicated efforts to create a society based on the export economy by inheriting new technology. Pointing out that friendship and co-operation with all countries in the world is the avowed policy of Sri Lanka, the Prime Minister added that it would strive to further strengthen friendship and co-operation with Asian counties such as India, Singapore, Malaysia, Vietnam, Korea, Japan and China. Explaining the Economic, Industrial and Tourist Zones to be set up locally in future, he pointed out the investment opportunities available to target 9 million people living around the Expressway network linking Colombo-Kandy and Hambantota. Singapore’s Trade and Industries Minister S. Iswaran also spoke on this occasion. Here are some of the questions asked the answers given by Prime Minister Ranil Wickremesinghe during the occasion. QUESTION:- What are the plans available in Sri Lanka for entrepreneurship development? ANSWER: At the outset an entrepreneurship culture should be promoted in the country. Traditionally we have been a trading nation and that tradition is still existent in the country. There is a large group of youth entrepreneurs in the country but their main problem is finding financial basis. The country’s banking institutions are still operating with caution and traditional basis. However much the government assisted small and medium scale ventures the assistance received from Banks is inadequate. As such the government has introduced relief measures to support entrepreneurs who have launched business ventures. Loan facilities for medium scale business ventures should be expedited. Banks in Sri Lanka should become project based institutions. The export culture should be introduced to small and medium scale business ventures. QUESTION: What is the impact of the Colombo Port City Project on the Economy of Sri Lanka? ANSWER: The Colombo Port City Project was started for property trade development. But under our government it has been planned to transform it into a financial city. Land filling in it will be completed by next year and thereafter building construction would begin. Already several financial cities have been set up in the Indian Ocean area. As such we should think of new services to be set up there. This is a project with a 10 year plan. The Prime Minister said during his visit to England a few weeks ago, he discussed possibilities of implementing the English laws in the financial city. Authorities in England agreed to discuss about the implementation of English laws and lend all possible support in this direction. Already plans are underway to introduce several new legislations relating to the financial city in Sri Lanka. The first step is to institute a Financial Commission. After discussing the matter and attendant problems and issues with the Attorney General a Cabinet paper would be submitted for setting up the financial commission of the Port Financial City within the next two months. QUESTION: How will the data collection and analysis process take place correspondent to the future vision? ANSWER: Data collection work is already in progress. An analysis in made on the impact made on the country’s economy. Data collection and analysis will be undertaken in cooperation with other countries in the future. This will be the final step towards making Sri Lanka the economic hub of the Indian ocean the Prime Minister said. Development strategies and International Trade Minister Malik Samarawickreme who delivered the inaugural lecture at the session said the Sri Lanka-Singapore FTA will provide a positive message about Sri Lanka’s development goals to the whole world. The government is committed to make Sri Lanka an economic hub in the Indian Ocean. The necessary internal reforms are now underway to make this possible laying emphasis on the Asian supply network and the environment would be created to link with it through export industries. For this Free Trade Agreements would be signed with several other countries. Deputy Minister Anoma Gamage, Sri Lanka’s High Commissioner in Singapore, Nimal Weeraratne and Colombo’s Mayor Rosy Senanayake were also present on the occasion. You are joking, not with you lot, yes when we get people who put the country first. White sri lankans in pics only !! Why the pictures of black sri lankans look white only in pics posted ? Does that means Sri Lankans reject their own black african skin color?? Very weird - all back sri lankans look whiter than white people in pics only , not in real life !! For 2500 years Sri Lanka could not develop itst economy currently 80% below poverty line . How on earth can it overcome poverty for the next 3 decades ? Prove me wrong ! The only way to stop politicians robbing the central bank of sri lanka - is for the international community who lend money and give aids to stand up and attach more strings and accountability before they lend money.Otherwise all that money will end up in the political coffers of the rulers !